Hi David, thanks for the message. We play up your way often, best keep an eye on the gigs page. 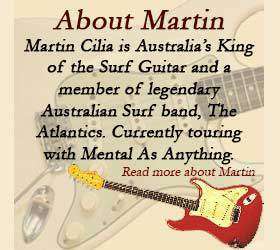 G’day Martin, love your work. Any chance you’ll be playing a gig in Adelaide at any time in the future.? Hi Colin, I’ve been to Adelaide twice in past few months with 2 different bands (but haven’t been playing the ‘surf’ tunes) back later in the year. I must have missed those but I will certainly try to catch one of your next gigs here then. Thanks Mate.